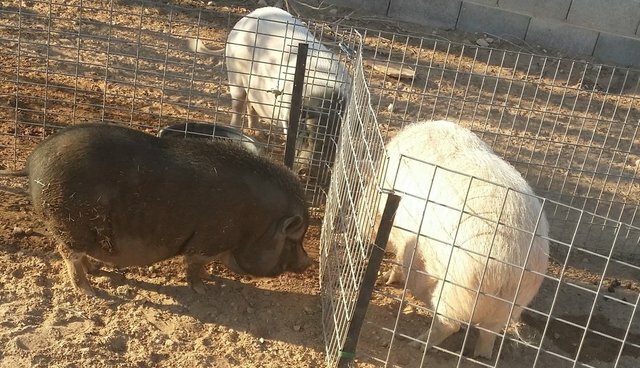 Pig-friendly sanctuaries across the country are becoming inundated with surrendered "teacup pigs" and well-intentioned pig parents are realizing they've bitten off more than they can chew. But what happens to the pigs? 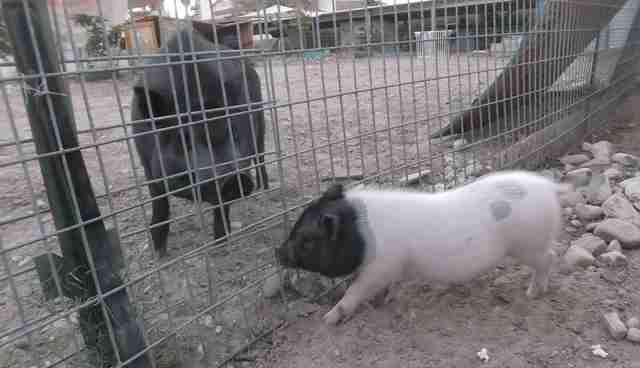 Crystal Kim-Han, owner of piggy rescue and education center VegasPigPets, told The Dodo the story of Danji, the abandoned "teacup" piglet, who came into her care starved and screaming. 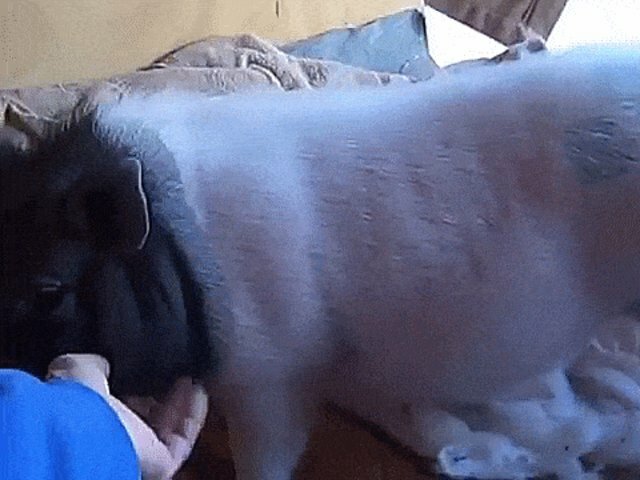 "Teacup" pigs have become so popular in recent years that "backyard breeders" for pigs have cropped up everywhere, and animal sanctuaries are now struggling to keep up. Unfortunately, too many prospective pig parents do not understand the space, money, and time that pig care requires; by the time they find they're in over their heads, it is too late for the not-so-little piggies to have a "normal" life. The "average pig surrendered to [VegasPigPets] is generally over 1 year old due to the fact that pigs grow for 4 to 5 years," said Kim-Han. "At 60 or so pounds [i.e., around 1 year of age, depending on the pig], people start to realize they had no clue what they got themselves into. 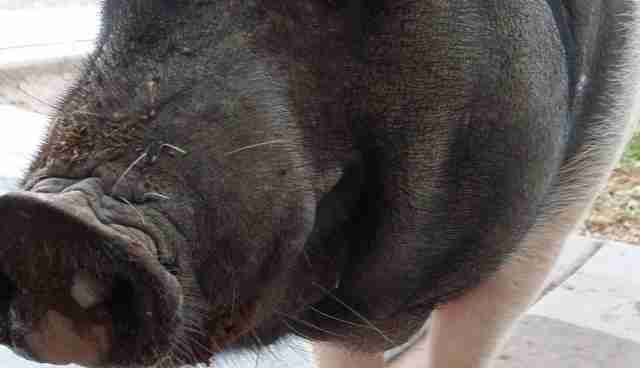 At about 2 years, a lot of pigs go through a 'terrible two' stage, comparable to a teenage child, becoming testy and rebellious, picking fights with their human household, even challenging the other family pets." 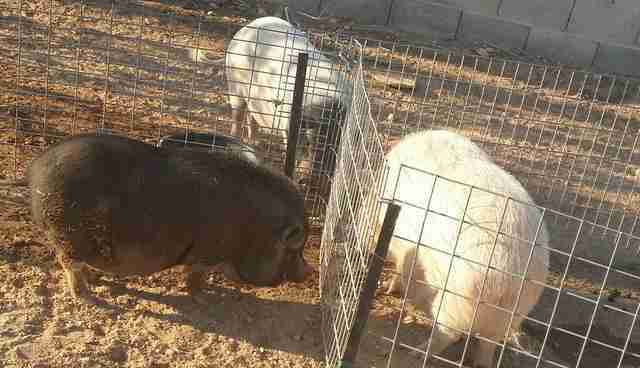 Like many other shelters that accept potbellies, VegasPigPets is inundated with requests to take in surrendered pigs - far more than they can accept. The sanctuary can only house eight pigs at a time due to the nonprofit's special use permit, a document that allows her to keep multiple pigs on her property in Las Vegas, where potbellied pigs are not allowed to weigh over 120 pounds. Therefore, Kim-Han said, "education is our specialty. I answer countless emails and phone calls on almost a daily basis" from overwhelmed pig parents concerning "biting, swiping, food aggressive pigs" - usually because the pigs have not been spayed or neutered. She hopes educating pig parents and working with them to find solutions for their pigs can help prevent further surrenders. Danji arrived at VegasPigPets under mysterious circumstances. "A family called me saying they 'found' him on the side of the road and he 'jumped in their car'," Kim-Han said. According to the family, "they could not keep him because of complaints to the [homeowners' association]. 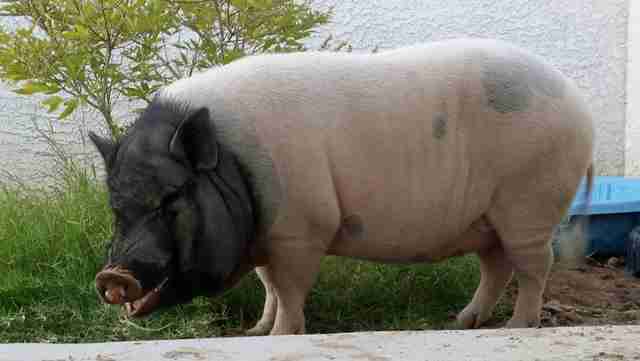 He arrived screaming at over 100 decibels," which sent all the other pigs into an uncharacteristic frenzy. 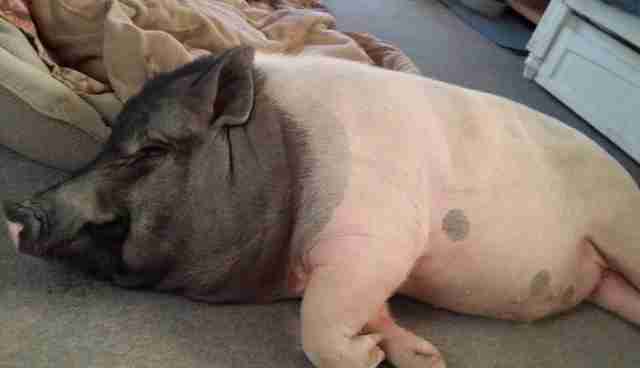 One of the pigs suffered a heart attack and died. 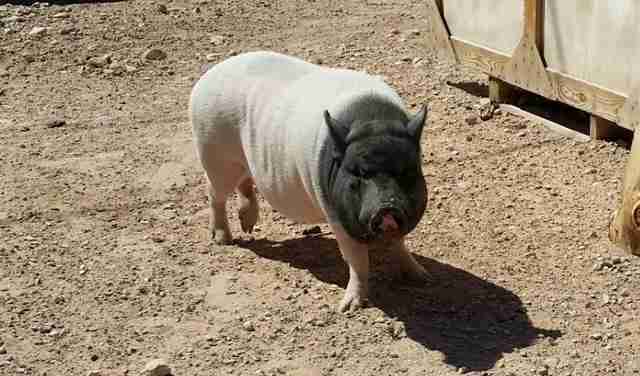 Although Kim-Han was able to track down Danji's litter mates and their birth dates - February 23, 2013 - due to their similar physique and markings, "the breeder would never confirm Danji was one of her pigs shipped [to VegasPigPets]." Kim-Han at least felt confident that Danji was around 7 months old when he arrived on September 14, 2013. It was alarming that he weighed a mere 13 pounds, however. "Normally, a piglet gains about 1 to 1.5 pounds per week their first year," she said. At 7 months, Danji should have weighed about 30 or 40 pounds. Over the next 5-and-a-half months, Kim-Han worked to help Danji socialize and gain weight. 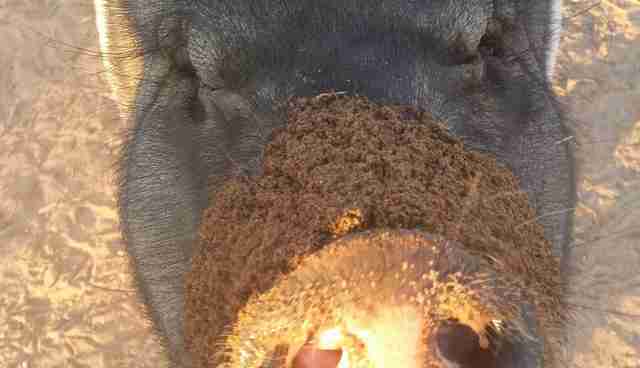 She put him on the rescue's "general regimen of two cups of potbelly pig pellets [grain-based pig food] and a fresh vegetable salad everyday," Kim-Han said. 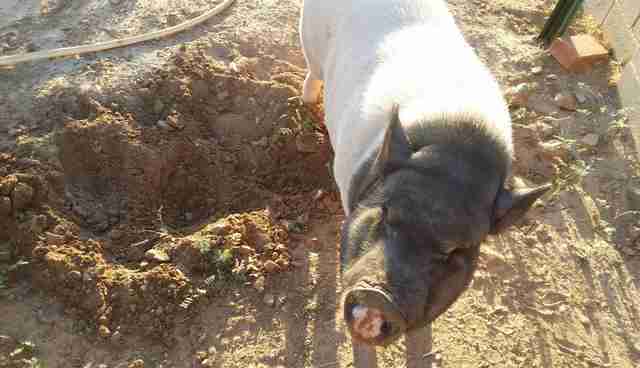 "Danji received more fruit than I normally give the other pigs just to help him try to catch up. Plus for training purposes, he got grapes as a reward. Making him sit and wait for his food taught him patience and ... not to be food aggressive." On March 3, 2014, Danji was able to leave VegasPigPets at "a healthy 74 pounds," according to Kim-Han, when he was adopted by a family with a 3-year-old child. Sadly, a few weeks ago, Kim-Han "received the dreaded call that Danji was becoming more and more afraid of [the family's] daughter" and was spending an unhealthy amount of time alone in his outdoor pen. "I do require adopters to return their pet pig[s] here if they can't fulfill their commitment," she said. She's thankful that at least they tried the adoption route rather than contacting a breeder when they decided to get a pig. 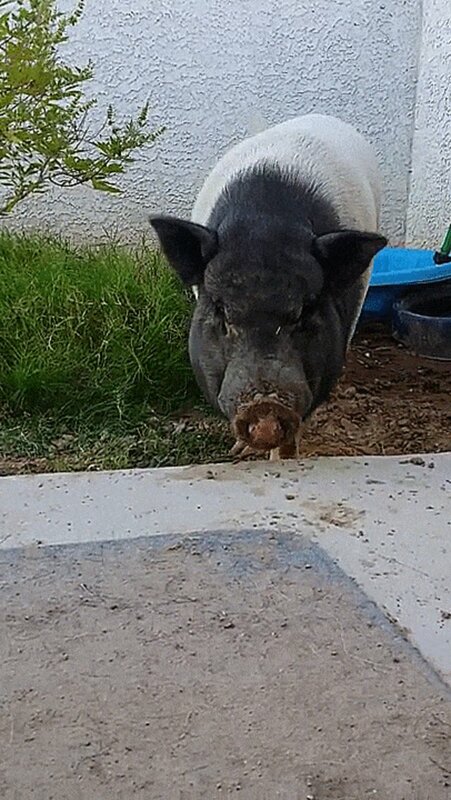 When Kim-Han brought Danji back to VegasPigPets this September, she was worried he would "go through a kind of depression/aggression period" that most pigs experience after being re-homed. "I don't think Danji was bonded very greatly to his adoptive family," she said, "so it's mostly him trying to get into a routine and he's still not quite sure if he needs to be afraid of anything yet." Luckily, he "is doing great for his first few days [back] here ... [while] getting to know the other piggy residents" and enjoying all the new-found space he has to root and dig around. Getting young pigs "a standard all-in-one vaccination, tetanus [shots] and wormed once or twice a year. In some areas of the nation, even rabies vaccines are recommended even though there is no rabies vaccine just for pigs." Don't take a chance with a pig's life! "So many people call [VegasPigPets] with 'emergency illnesses' because they have nowhere to turn," Kim-Han said. "No vet will see their pigs and most breeders won't sell the pigs spayed or neutered (mostly because they are too young and too small)." 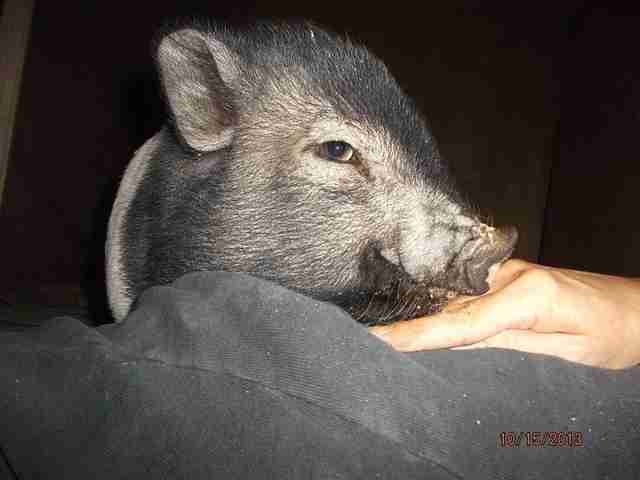 Danji is now healthy and, thanks to Kim-Han and his new piggy friends, he's getting more active every day. 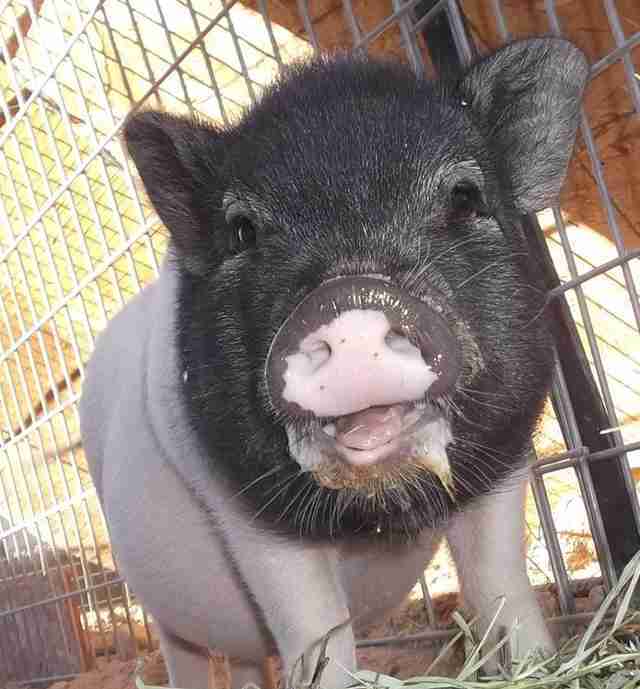 But, Danji and many pigs like him still need a forever home. 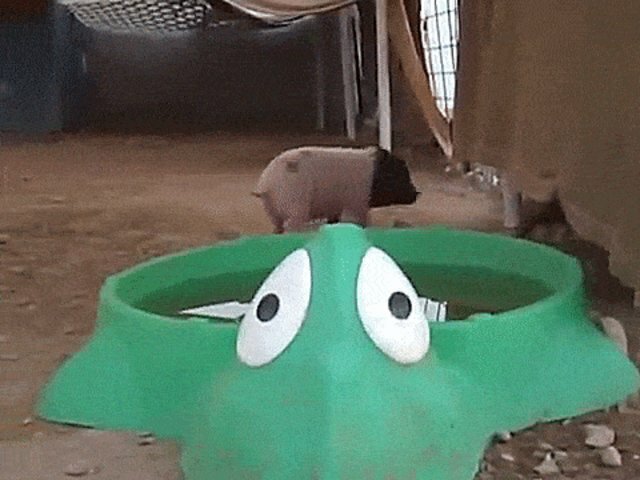 If you'd like to learn more about "teacup" pigs, you can find more information at TeacupPig.info, a site founded and maintained by Crystal Kim-Han.